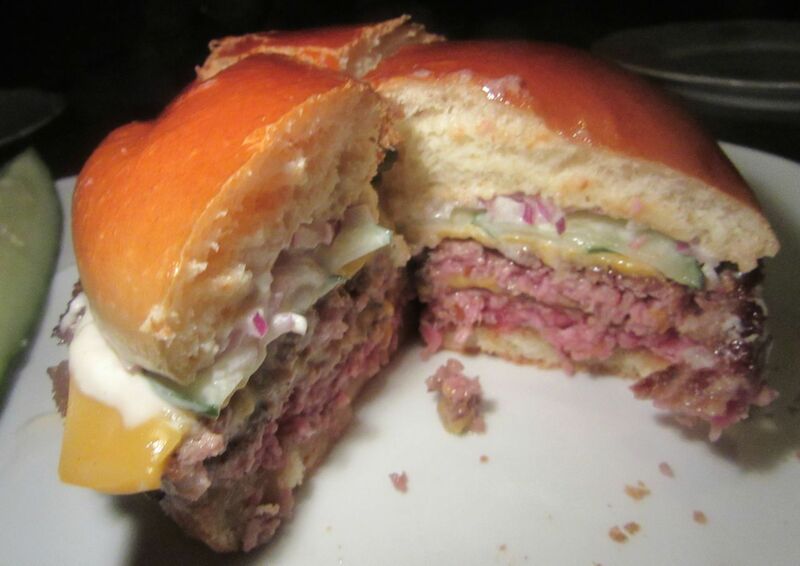 Is this the famous Chicago burger? Well, it’s good, but no match for Salvation’s classic. Well yes, our pampered foursome had fun as we wallowed cautiously in delicious excess at 4 Charles Prime Rib. But I’m not doing you a big favor letting you know about it. It isn’t easy getting past the front door into this crowded 19th-century doll’s house. There are just ten tables, only 36 seats. It’s small and dark, just 36 seats. I can’t see my feet in the shadows. It’s very dark. I look down at my feet to be sure there’s no step at the entrance but it’s too dark to see my feet. 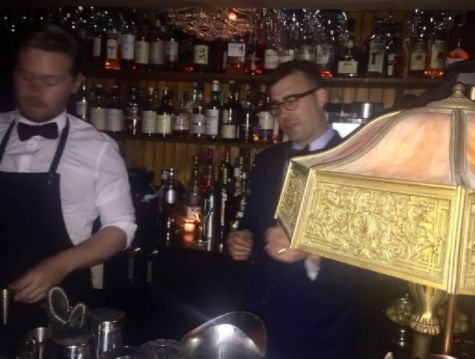 If you take off your glasses, you might imagine there’s a few extra tables at the rear, but that’s just a mirror. You probably can’t get a reservation, or won’t if you resent booking weeks ahead. They don’t answer their phone. A recorded voice refers you to the website. Resy shows few tables earlier than 10:30 pm in the next lunar phase. I suppose you’re wondering why I bother to tell you about this impossible place since I’ve never exhibited sadistic tendencies before. 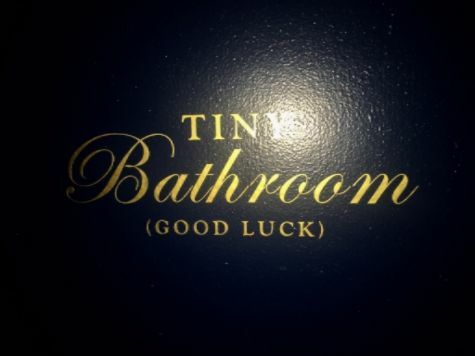 Lots of luck in the bathroom, too. Photo by Dana Stoddard. 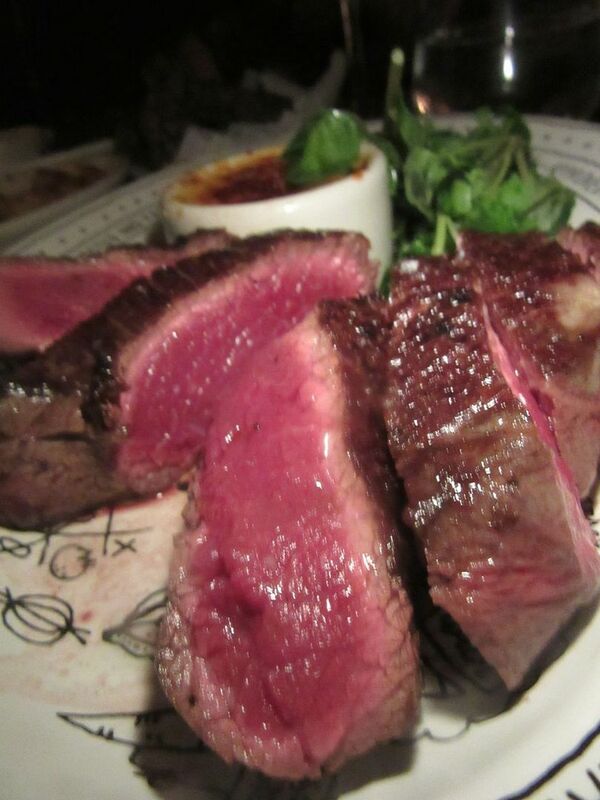 Eater’s Ryan Sutton has written an angry documentary on the anatomical dangers of eating a côte de boeuf after midnight and why you wouldn’t want to go to 4 Charles even if you could get a spot at dinnertime anyway except that the prime rib – salt-crusted and roasted 12 hours -- can be so good. Send him flowers, or at least a “get well” card. The walls are paved with an eclectic collection of thrift shop art. 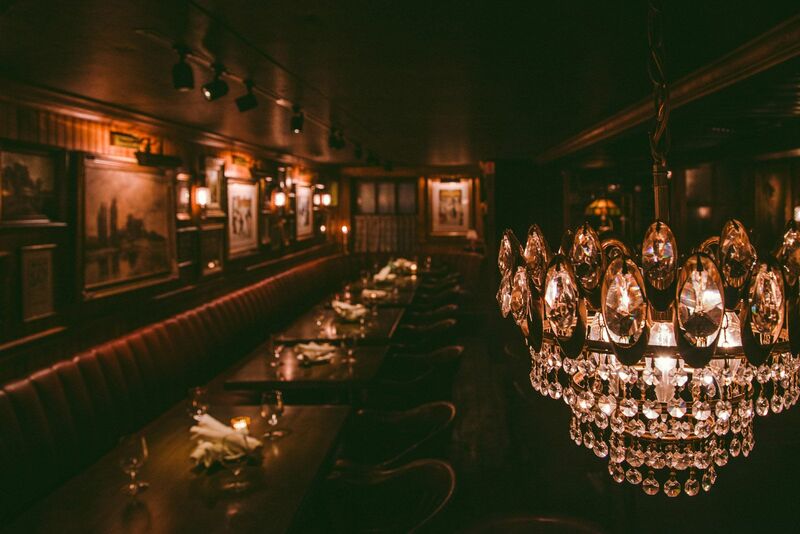 Wood-lined walls, tufted banquettes, bare tables and more or less solicitous waiters rule the evening. That’s how, as the couple ahead of me is rejected and fades away, I am welcomed warmly at 7:25 pm on a Friday night into the darkness and led to what strikes me as a royal banquette. The architecture is not steakhouse classic. The abundance of décor with its flotsam of framed “art” has a thrift shop feel. 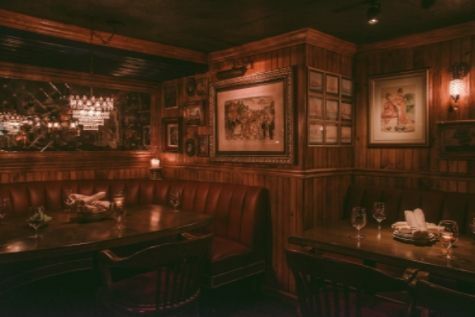 But the menu confirms it’s definitely a steakhouse, with pricey butcher cuts as specials and, of course, options in prime rib. Don’t count on coming early and sitting at the bar. The bar is for storing bottles and pouring. Caitlin is unhappy with her super-boozy $18 Oaxacan cocktail. It sounded like a Margarita when she chose it. But its stiff mix of mezcal, tequila and bitters is too smoky. 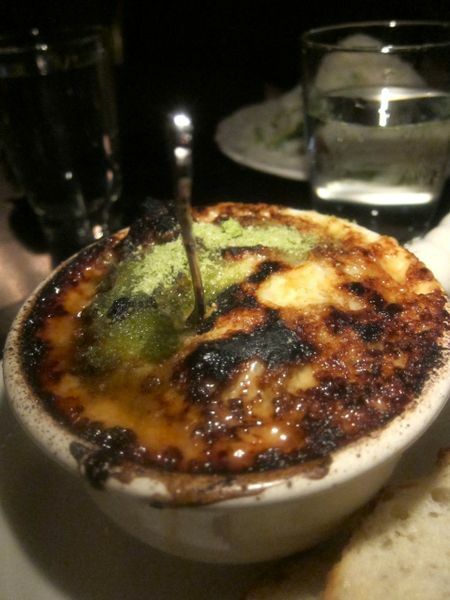 “No problem.” Our solicitous waiter hands it to a busser. It’s gone, a credit on the check marked ”goodwill.” Caitlin will have an $18 Chardonnay instead and sip it like a royal as I order the $13 Syrah and we plan dinner. Niece Dana is late. 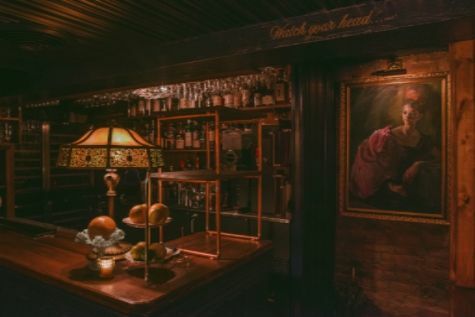 “I walked by it twice and missed it,” she says, settling in to the jazz and swing that evokes Scott Fitzgerald-ish reveries for me in this tight little cubby. 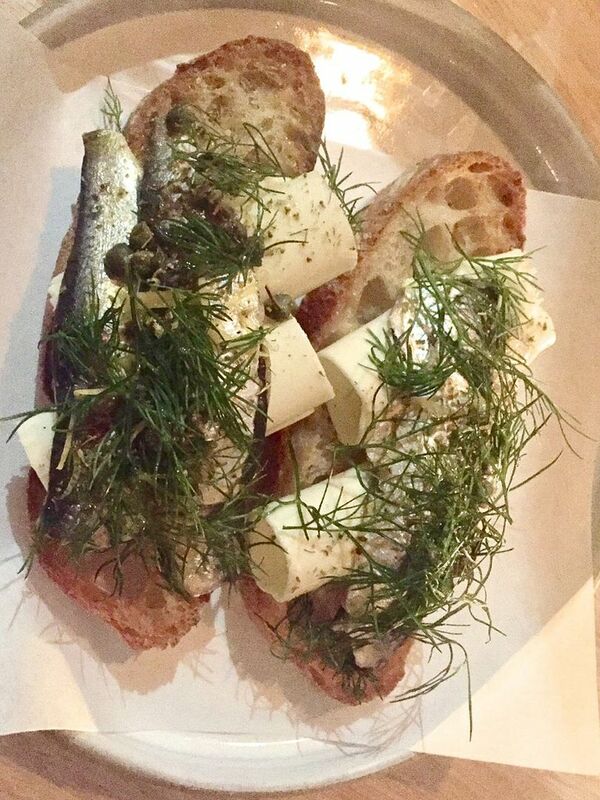 I suggest everyone order a starter and then we’ll share two or three entrees, but the others are so caught up in getting-to-know-you that it’s left to Caitlin and me to negotiate. The shrimp are nothing much, but the buttery goo makes for great dipping of garlic toast. 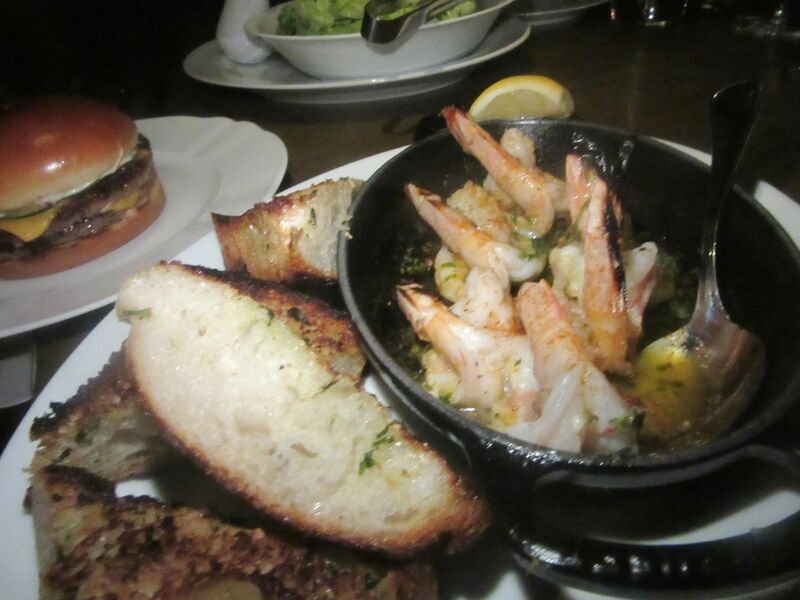 We consider the crab cake -- yes, no, maybe -- and quickly abandon thoughts of Alaskan king crab at $75 a lb. We’ll be sharing everything, of course. The sizzling shrimp scampi in their shells are small and tight, best ignored, but their fragrant bath makes for great dipping of thick garlic-toast chunks. Good to the last dab. 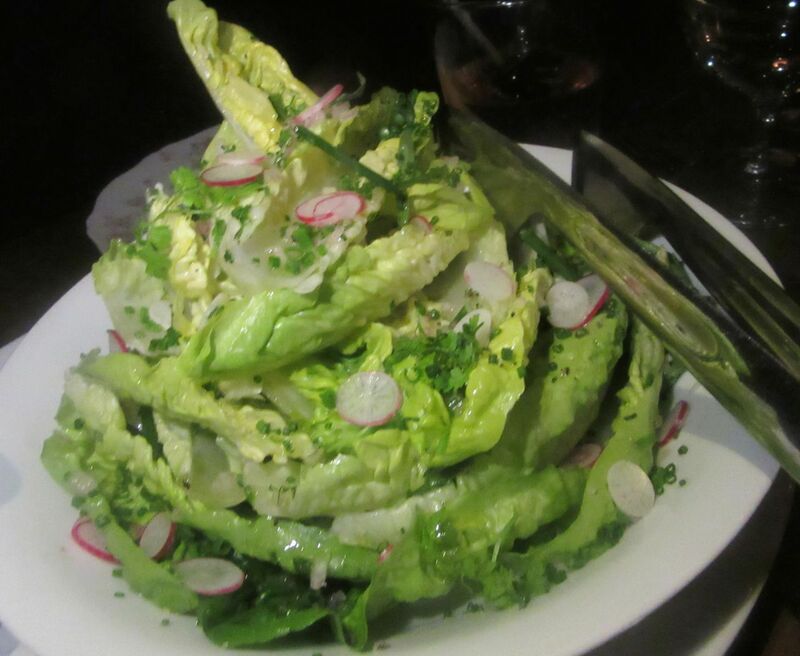 Crisp gem lettuce in a proper vinaigrette is a virtuous prologue to an excess of cow. Crisp leaves of gem lettuce in a proper vinaigrette are the perfect palate cleanser and a good psychological prelude to a meaty binge. Our attendant’s eyebrows rise when I insist I want the “American cheeseburger” with our starters. He doesn’t think we should have it with bacon, $3.95 extra, or a fried egg, $2.50. Our guide and servitor puts on latex gloves and obligingly quarters the burger with precision. “If it’s your first time tasting this burger, you should have it plain,” he says. Of course, I don’t agree, but I give in. It’s two skinny burgers, he warns, and it might not be rare. (I thought Chicago was a meat-forward town.) It’s a dramatic turn in the story, especially when the burger arrives puny, looking fiercely plain on its plate in spite of its secret sauce, not cut into quarters as I requested, with ketchup in a tin cup. (No fries is my fault. I forgot). 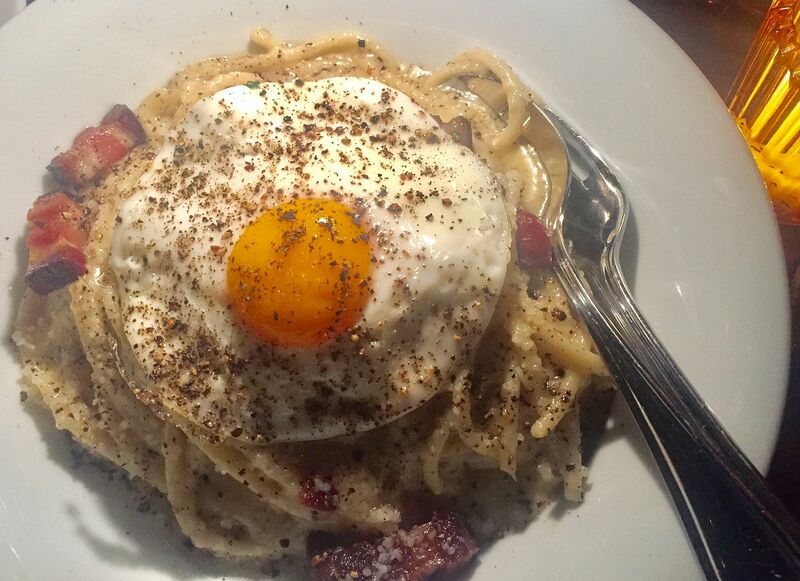 The Cacio Pepe Carbonara bucatini pasta trades classic cred for delirious excess. He puts on white latex gloves and brandishes the knife, arranging the quarters so I can get a better photo. It’s almost like having our own butler. The burger is almost, sort of, kind of good, rosy but not caramelized like April Bloomfield’s classic at Salvation Burger. 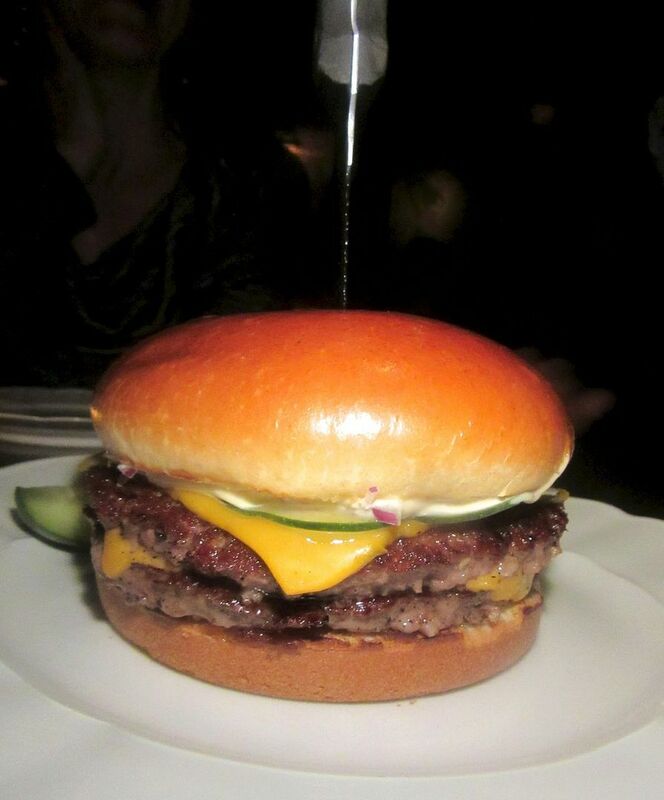 And it’s not even close to the greatness of the everyday burger at Minetta Tavern. Burgers are such a personal thing. Better try it, $18.95 plus four bucks for the bacon. Charred Brussels sprouts with Parmesan, bacon and Dijon are faintly sweet yet definitely a triumph. But we’d already decided to divvy the crispy brick chicken and the $24 Cacio Pepe Carbonara Pasta. That manic bucatini with thick-cut lardons, toasted black pepper, pecorino and a sunny side up egg to smash is wildly lush. My favorite superfluity of the evening. 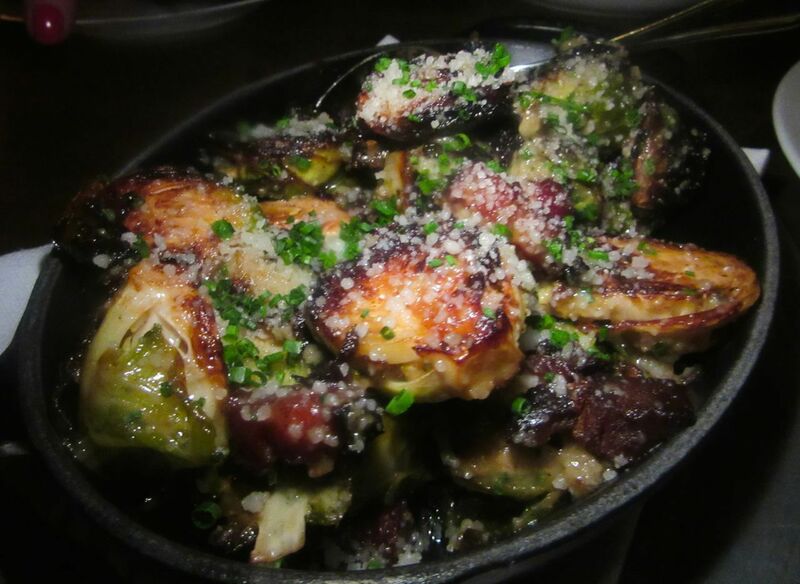 The charred Brussels sprouts with bacon, Parmesan and Dijon are astonishingly good. “These Brussels sprouts alone could be dinner for me,” Dana enthuses. 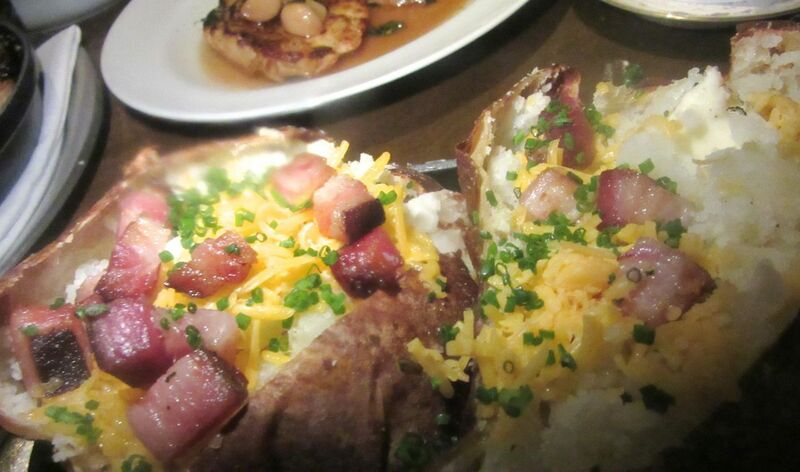 A $13 side of elephantine baked potatoes, loaded with cheddar, sour cream and yes, of course, bacon, is marvelous too. I urge Caitlin to take the leftovers home for breakfast. Is this a loaded baked potato or two loaded beauties? Bacon again, of course. Great for breakfast, too. I certainly don’t need the chicken. It’s very salty and no one wants it. As before, our keeper graciously whisks the condemned bird away, deducting $26.50 from the bill with the note, “Dissatisfaction.” I don’t need the prime rib either at that point. But we’ve ordered the $40 “thin sliced and delicate” 10 oz. English cut, bright rose, almost red. The top slice is salty, but the rest, merely silken and meaty. “Bioluminescent,” Sutton called it before succumbing to heartburn and dyspepsia from his midnight encounter. 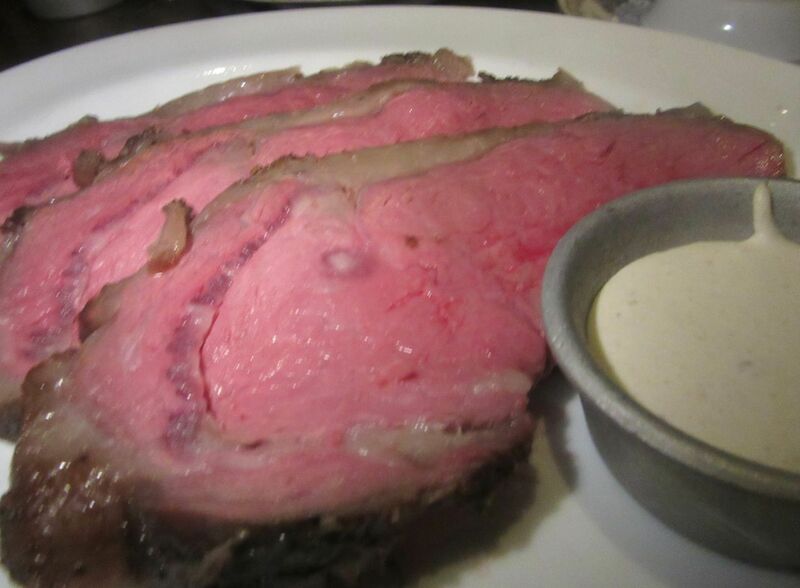 How can it be that the slow roasted prime rib is rose pink all the way to the edge? Salt-crusting maybe. We started as early birds. Now it’s getting late, but we must have dessert. 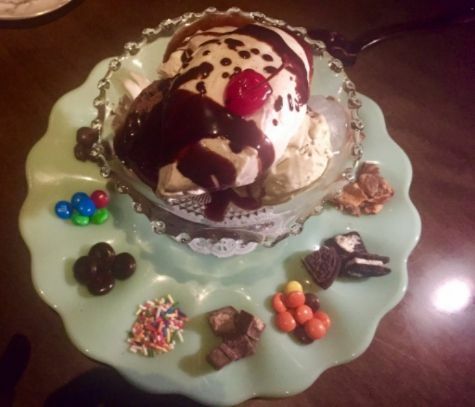 We’ve already decided to have the monumental sundae we saw at the next table when we arrived. I might be put off by the greed of an $18 lemon meringue pie or the similarly priced chocolate cream pie. The place is definitely expensive. But the $21 Sundae Royale is worth every dime. Tall and stately, it arrives with three scoops of ice cream, ready to be doused with hot fudge, surrounded by candies and bits of cookie. Oreos, M&M’s, Mint Patties, Sprinkles, Raisinets, smashed Reese’s Peanut Butter Cups. The $21 Sundae Royale with hot fudge is surrounded by classic foldins. My idea of fun. At this point everyone is smiling. And given “goodwill” and “dissatisfaction” and not many drinks, our bill is only $65 each, tip included. Do I seem to be suggesting you might want to line up eventually? Maybe come spring. I wouldn’t join a queue, but some people are willing just for a Cronut. Of course, I’m spoiled. Please don’t hate me. 4 Charles Street, between Greenwich Avenue and Waverly Place. 212 561 5992. Seven days a week 6 pm to midnight.